If you go down to the woods tonight, you’re in for a big surprise………. Sadly there are no teddy bears this time around, however that is where the disappointment ends, or relief begins! 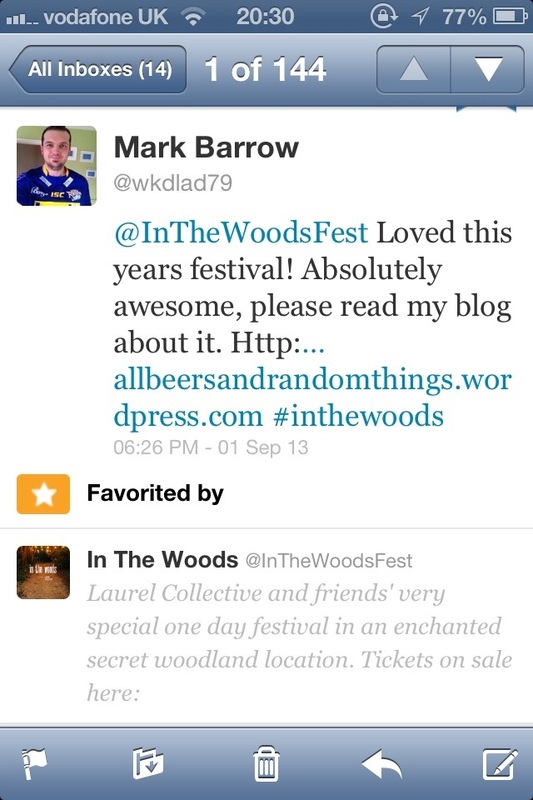 I am talking about The Laurel Collectives intimate offering of In The Woods 2013. 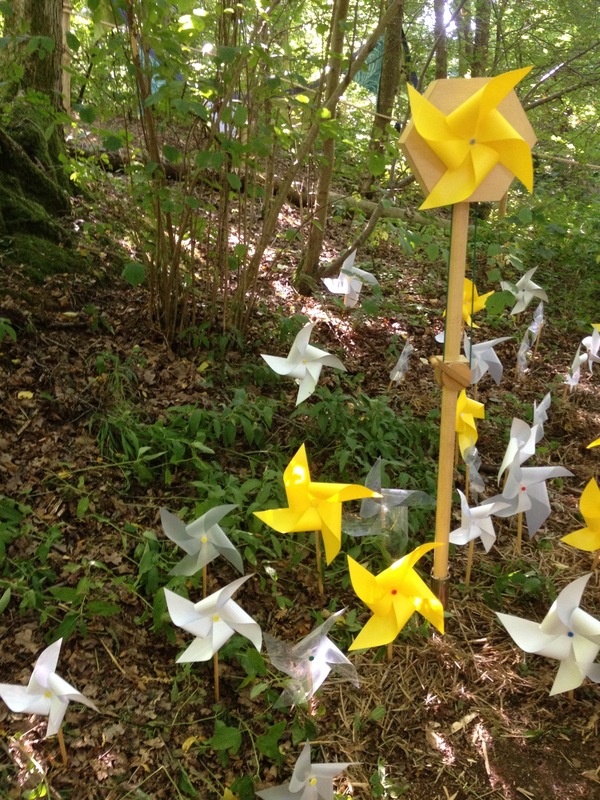 In The Woods is a festival with a difference, in fact many differences to those other festivals that many of you are familiar with. The only similarity that came to mind is the point where we exchanged our tickets for a wrist band. Once this formality was completed the whole experience and world offered to us was so very very different to that of a commercial festival. For this years festival there were just under 1,000 tickets made available for sale. This number allowed for people working at the festival and the only way we were able to get tickets was from the lessons we learnt in our failings last year. The whole package is very secretive and the website gave very little away. If it wasn’t for my partner subscribing to the mailing list, we wouldn’t have received the link sent earlier this year to apply for tickets. These tickets were so hot, that they were all snapped up in less than 12 hours as soon as the remaining ones went on General Sale. In The Woods is a festival founded by The Laurel Collective who are a band keen to give up and coming artists a platform and unique environment to showcase their talents. This was the same festival that a couple of years ago presented Alt-J and Stealing Sheep to the world. Alt-J subsequently won the Mercury Music Awards in 2012 and Stealing Sheep are becoming better known. This alone shows the power and success that this intimate festival can offer the bands that are hand picked to perform. 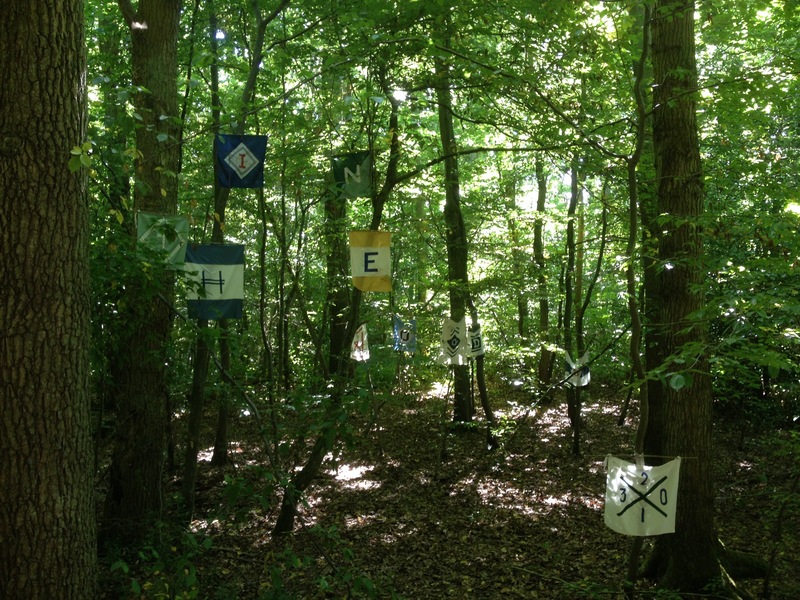 In The Woods is so shrouded in mystery that all we knew until 2 days before the festival was that the location was no more than an hour from London in Kent. We didn’t even know the line up, this was intended to prevent anybody from knowing about it. This made an already exclusive event even more so. Once we had located the venue only made possible by the delight of Google Maps we were presented with a field and a short walk to obtain our wrist bands. The security check was thorough, if we didn’t have ID that matched our tickets, we weren’t getting in. The next thing we were presented with was the most picturesque and mysterious entrance to what would be our surroundings for the next two days and nights. The camping area was spacious and no more than 2 minutes away from the bar area and entrance to the woods. We got our smaller tent set up quickly and we found ourselves ready to explore. This was the first time that they opened for the Friday night and it was obvious that the majority of people present were keen to take up this opportunity. It was like the scene from Willy Wonker and the Chocolate Factory, everybody extremely keen to wander off and explore what was within the woodland arena. The promise of local foods and ales were fulfilled and this was all prepared in traditional ways. We were treated to Curry, Chorizo and Sausages as well as a Hog Roast with the first two cooked over large cauldrons sat on open fires. The bar was full of casked Ale whilst the choice of home made smoothies and Mojitos a welcome alternative. It had all been thought through carefully and the pub quiz on the Friday night settled people in nicely and created a vibrant buzz amongst the hay bales and retro board games. It is at this point I am struggling to find the right words to describe this festival which do it justice. Imagine pathways within the woods covered in straw with plants on either side guiding you along. These pathways are covered by small pretty lights hanging amongst the trees to guide you along when it’s dark. As you first enter the woods you can help yourself to a mask pegged on lines, you can even stand behind one of many picture frames hanging from trees and have your photo taken behind them. 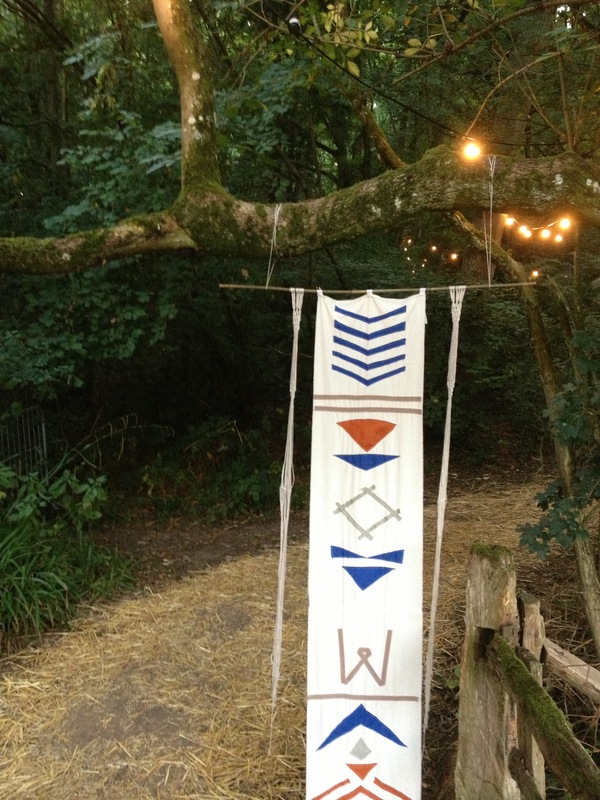 There is a cardboard train and a saloon where you can find yourself in the Wild West and there are mysterious banners and bunting hanging from the trees branches that grace the pathways. There are secluded areas that you can wander into and be thrown into a whole new scenario. Be it spoken poetry or written stories, we found ourselves stumble into a theatre staged Leafy Art Exhibition and tour which involved many characters that made even me question if they were real or acting. Please check out Direct-H on Facebook, they were very very convincing and had me fooled. We were led around various art pieces including a Sodium Chloride Dog with an Electric Lamp and a Teddy Bear with a tilted head. 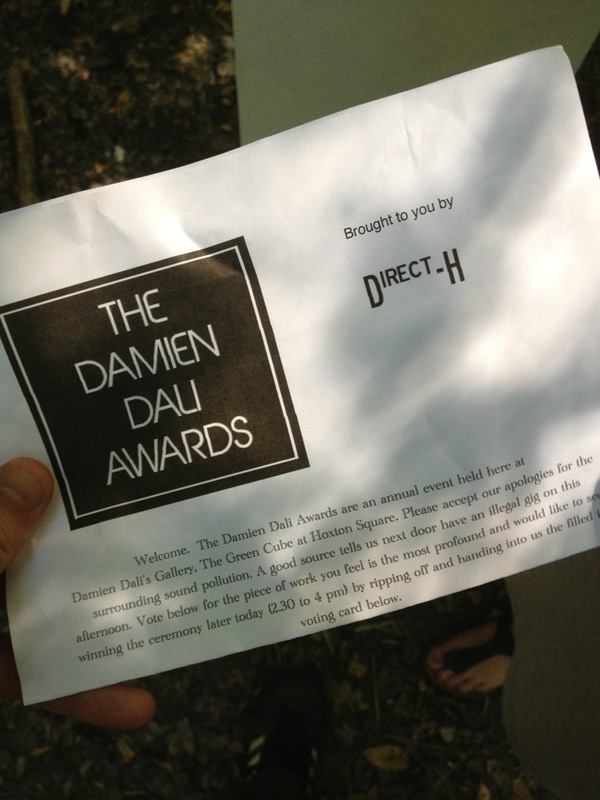 The Artist holding the champagne studded show was none other than the flamboyant Damien Dali. With his surrounding cast of characters they put on a creative and entertaining show, with the hunt for votes and Damien a priority towards the end. There is an area no bigger than a front room with two record players on and a big bundle of Vinyl Records. We sat down on the final night just soaking the atmosphere whilst listening to Alt-J album on Vinyl. The beauty of this festival is no matter where you are within it, you can find yourselves alone due to there being less than a 1,000 people there. It’s because of this you can truly let yourself escape and your mind wander. So what about the music? Well the artists and bands played across two stages which were no more than a 30 second clamber through a woodland clearing. The performance times staggered so you could see them all perform. On the Friday night we saw Lianne La Havas open up the festival with beautiful piercing vocals and notes held so long you could really feel the Acoustics bounce off the trees surrounding us. 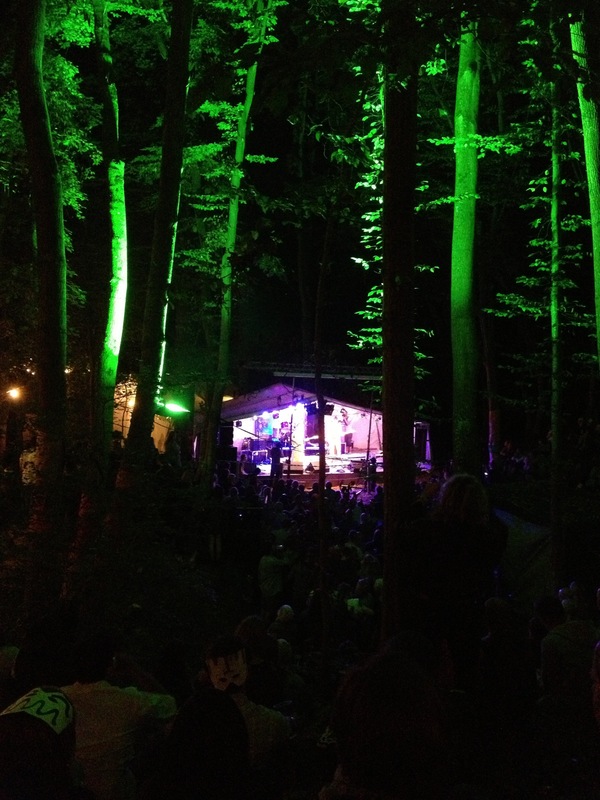 We were sat at the back on a log looking down at the stage, the view absolutely magical. It was then we watched a film documentary called Searching for Sugarman which is truly amazing. On the Saturday we threw ourselves in and checked out some of the other artists, all that we hadn’t heard of so we were bracing ourselves for what we’d hear. 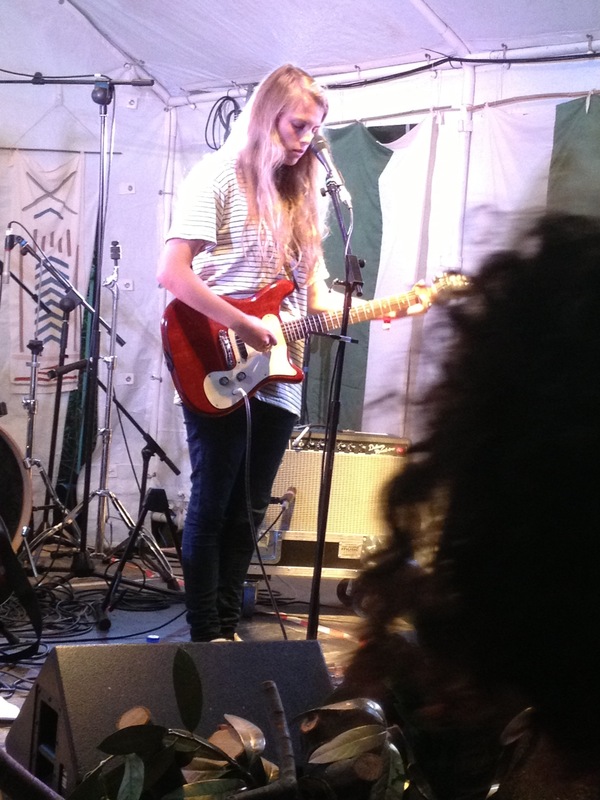 The highlights for me were Khushi, Nick Mulvey and Marika Hackman. Khushi will be going straight onto my IPod as they were fresh and pleasing to the ear. Their sometimes haunting vocals sent a shiver down my spine. Secondly on the smaller Laurel Lounge stage I was impressed with Nick Mulvey who I joked looked like Jack from Lost and was totally drawn in by Marika Hackman. She reminds me of Fredrika Stahl and as we heard her prepare for her set, it provided one of the closest and intimate moments of the entire festival. It was it this point you could feel the moment of tension before she launched into her set. As the music drew to a close on Saturday night, the final moments presented an orchestral performance where there were trumpet players situated around the top of the Quarry Stage. We were sat next to one at one of the higher viewpoints, it sounded amazing. It wasn’t the end of the magic just yet, there was still so much more to offer. The final breathtaking moment came when they lit the Bonfire which was situated in the field by the bar and food counters. 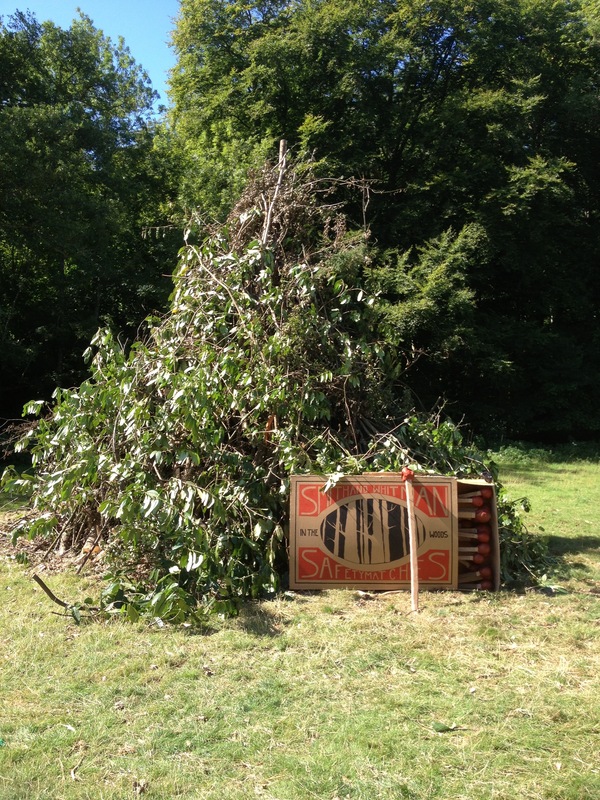 This bonfire was massive and it was here that the welcome heat lost from leaving the woodland could be appreciated. As the flames stood tall and the orange specks filled the midnight sky there were also fire dancers performing around the edge of the bonfire. We also met back up with some people we met in the woods earlier in the day and enjoyed their company amongst others. It’s safe to say this is a moment that will not escape my mind in a lifetime. So in conclusion, please don’t make this event any bigger, leave it be. This is amazing and the most intimate experience I’ve shared with others ever. That last line sums it up perfectly, no trouble, family friendly and easy to talk to and meet new friends. Amazing!! I know I’ve missed many things but I truly hope this paints some of the picture I’m trying to paint. 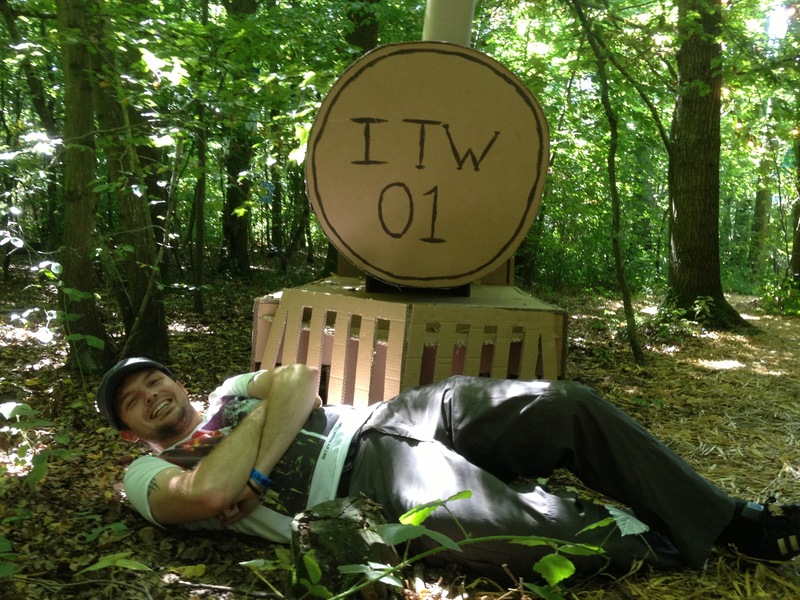 In The Woods 2014, I can’t wait! 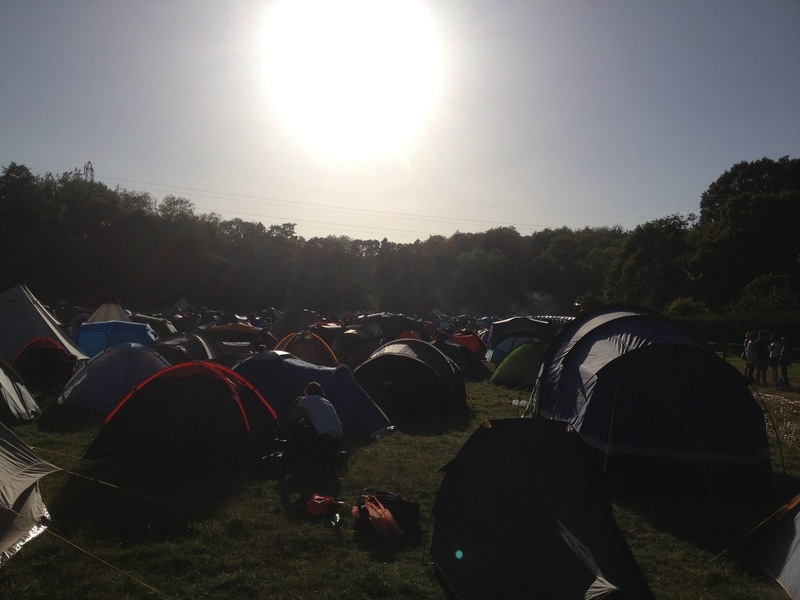 Posted on September 1, 2013, in Camping, Festivals, Music, Nature and tagged Alt-J, Bonfire, Direct H, Festival, In The Woods, Kent, Khushi, Landshapes, Laurel Collective, Lianne La Havas, Marika Hackman, Nick Mulvey, Woods, Young Fathers. Bookmark the permalink. 1 Comment. i think by joining a campsite make a person feel relax. In the campsite one can leave exhausting weekly pressure.